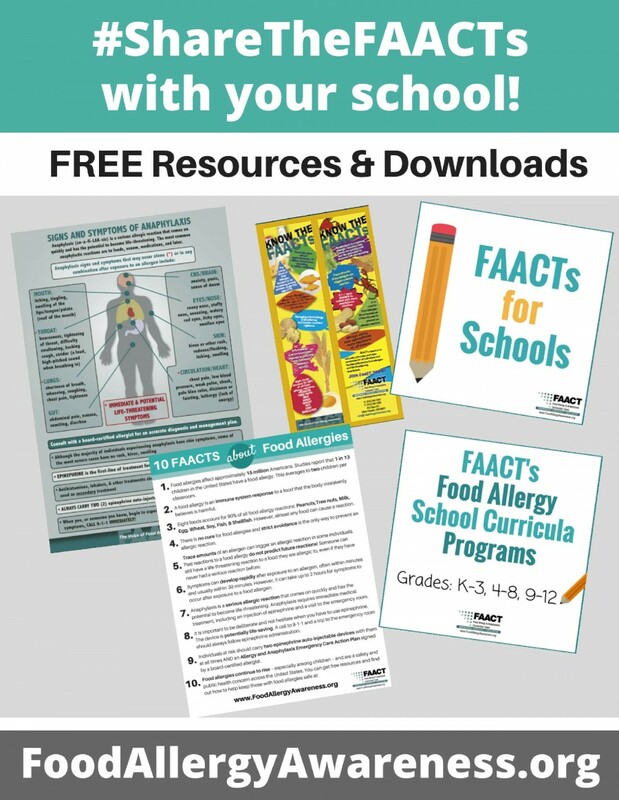 FAACT launched its Food Allergy School Curricula Program for K-3, Grades 4-8, and Grades 9-12 in May 2015, another program that fulfills our mission to educate, advocate, and raise awareness for all individuals and families affected by food allergies and life-threatening anaphylaxis. The teacher-designed PowerPoint presentations, lesson plans, and activities in this free curriculum can be used to introduce your students to common food allergens and safety protocols while encouraging empathy for classmates with a food allergy. Complete the short form on our Web site and download the free programs today! Then all you have to do is click on the below programs you wish to download and print. Be sure to share them with your schools and colleagues. FAACTs for Schools brings a complete educational program directly to schools. Our educational presentation, Get the FAACTs About Food Allergies, contains an overview of food allergies including current best practices based on the Centers for Disease Control’s “Voluntary Guidelines for Managing Food Allergies in Schools”. With a pretest, post evaluation and complete talking points, this presentation can be used by parents or educators to educate school personnel nationwide. Also included in our completely free package are convenient handouts such as FAACT’s 10 FAACTs about Food Allergies. Bullying - What Is Food Allergy Bullying? Food Allergy Safety - It's A Matter of FAACT!